High-Luster vs. 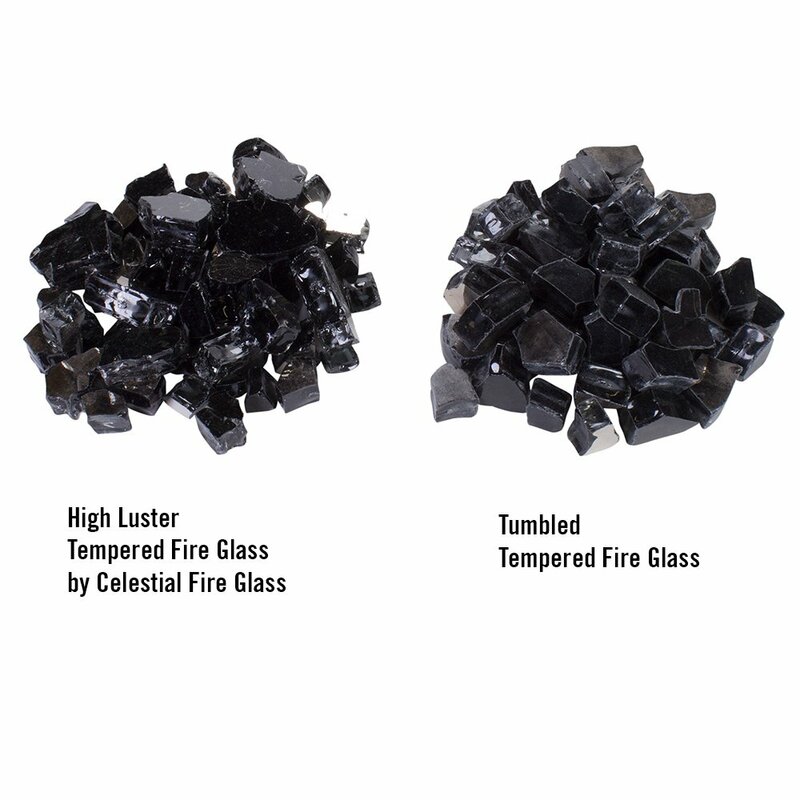 Tumbled Fire Glass: Which Is Right for You? Customers often ask us if Celestial’s Tempered Fire Glass is tumbled. In a word, no. Tumbling tempered fire glass involves placing the glass into a revolving bin for a given amount of time. The rotating motion wears down the sharp edges of the glass pieces, resulting in glass that is safer to handle. Here’s the problem with tumbled glass. The same process that removes sharp edges also dulls the surface of the glass, giving it a “frosted” look that dulls its reflectiveness. Since we want you to have the most dazzling visual impact possible with our glass, Celestial has developed a special, proprietary vibration process that softens jagged edges without compromising the smooth, reflective surface. Most of our tempered fire glass has a mirrored coating on one side to amp up the sparkle even more. This finish reflects sunlight in the daytime and the flames of the fire at night. High-luster glass is the best choice if you’re looking for top-shelf shine and glamour in your backyard fireplace or fire pit. Crushed Fire glass: This type of fireplace glass is crushed rather than shattered, resulting in small, gravel-shaped pieces. The gravel shapes have edges, but they’re less sharp than tempered fire pit glass. 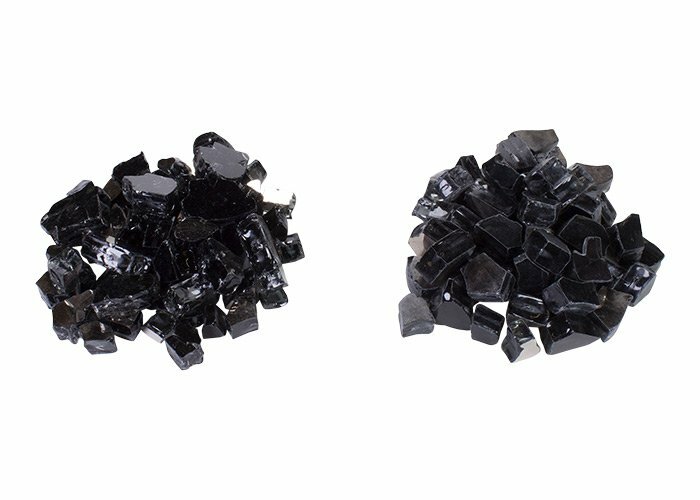 Crushed glass offers some degree of reflectiveness in the light, but its main feature is the rich, textured color it brings to your fire unit. Diamond Fire glass: The rounded edges on Diamond Fire glass pieces make this variety a very safe choice if you have small children and pets. We’ve also added an iridized finish that makes this type of fire pit glass shimmer and shine. Stylish and on-trend: Colorful, shimmering fire glass makes a dramatic impact that will “wow” your houseguests. Low maintenance: Other than the occasional cleaning fire pit glass doesn’t require tending like wood or lava rocks. It’s highly durable and retains its color and shape, fire after fire. Eco-friendly: Concerned about our environment? You can feel good about putting reusable, non-toxic, non-fuming fire glass in your fireplace. Fun and creative: No need to stick to one shade. Fire pit glass is available in a mind-boggling array of colors. Mix them up and make a statement! Subscribe to our mailing list to receive updates on new arrivals, special offers and promotions. You put a lot of time and money into creating the perfect fire pit. Don’t cut corners by filling it with substandard fire glass. When it really matters, use only high quality Celestial Fire Glass. Celestial Fire Glass is a high quality fire glass which was developed specifically for high end fire pits and fireplaces. Our fire glass goes through an extensive testing process to ensure that only the best quality product is delivered. Connect with us on our Social Media platforms and share your experience with the world.